We love to welcome travellers young and old(er) to Scotland, and with a vibrant international and local student population at our Scottish Universities and Colleges it is no surprise that the time away from lectures and study books is often as much of an education. Getting out into the fresh air every now and then and exploring with family and new friends is a great way relax and de-stress and experience the country you call ‘home’ for those precious three to four years of study. Laura Conroy, all the way from New Zealand, is a PhD student at the University of St Andrews and has done just that. Wanting to escape St Andrews for a wee break from studies she spent a weekend in our Highland capital of Inverness for her first experience of the Scottish Highlands. Laura has kindly shared a few highlights with us. When younger I loved myths, legends, and ‘unexplained mysteries’, so the opportunity to go Nessie spotting was a childhood dream come true! Although Loch Ness and Urquhart Castle aren’t far away, I decided to join a local tour company, Jacobite Loch Ness, from Inverness Bus Station. Pleased not to blow my student budget, I enjoyed a trip along the Great Glen, a half-hour cruise on Loch Ness (in a boat with a built-in sonar looking out for Nessie! ), and an hour to explore Urquhart Castle. Coming from New Zealand, I don’t think castles ever stop being exciting. Now mostly in ruins, the approach from the loch made for fantastic photos, but there was enough of the castle remaining to satiate my interest in history. 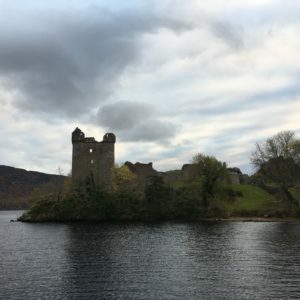 I was worried about taking this trip in the afternoon due to the short winter days, but visiting a castle with the sun setting over Loch Ness was an incredible experience. I’m ashamed to admit that I hadn’t heard of Culloden until a friend gifted me a copy of the hit TV series Outlander, but the dubious introduction to this important historical event left me interested enough to venture to the outskirts of Inverness in search of the battlefield. 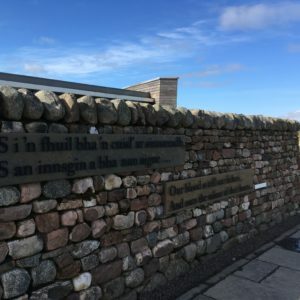 Recently revamped, the Visitor Centre, managed by the National Trust for Scotland, was engaging enough to keep my history-student mind occupied whilst simultaneously being accessible enough for those less museum-inclined to enjoy. 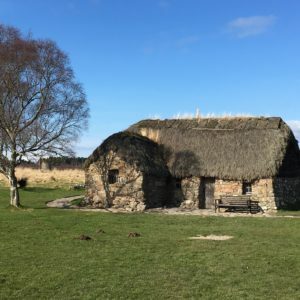 A highlight was walking around Culloden Battlefield itself, and although you can do this for free, the audio-guides enhanced my understanding of the site’s history. I took a short walk around the corner to Clava Cairns, also made famous by Outlander, but fascinating in its own right! There was little information at the site, but it was fun wandering alone through the standing stones. I accidentally stumbled upon Inverness’ oldest church while walking along the River Ness. There are boards explaining the history of the church outside, making a short stop worthwhile. Having visited Culloden, I found it interesting to learn that the church was used as a prison for captured Jacobites following the battle. A highlight (although slightly grim) was finding a tombstone used by government soldiers to prop up their guns as they executed Jacobite prisoners kneeling behind the opposite tombstone. The other end of the River Ness was cheerier – the Ness Island Walk is an easy one-hour route through the bush. 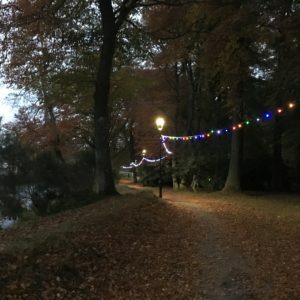 The trees are lined with fairy lights, making this lovely in the evenings. It was refreshing to be in a busy shopping area one minute, and in a quiet, atmospheric riverside walk the next. Although small, Inverness has enough variety to keep everyone excited and entertained. These are just a few highlights of Laura’s time in Inverness, and she has plans, in-between submissions, to return to the Scottish Highlands and the West Coast to explore more of bonnie Scotland. In 2018 Scotland will celebrate The Year of Young People so this is a great opportunity to encourage young people from at home and abroad to have a wee break from the screens, pop the pens down and give the mind a rest to experience something new, something unexpected, something you’ll remember forever. When pennies are tight a wee road trip doesn’t need to break the budget with a number of great hostels, B&B’s and self-catered properties around the country to be your base. From adrenaline filled adventure breaks and breath-taking road trips, to a range of exciting events and festivals, Scotland offers endless things to see and do during the celebratory year. Keep in touch for details or to start planning your adventure in Scotland!